People who write to the papers about language issues do get awfully confused. There’s been a good deal of discussion in the media recently about teenagers’ supposed limited vocabulary. People have been saying and writing a lot of nonsense about it, as ably exposed by David Crystal. 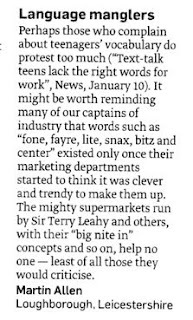 Now someone writes to the Sunday Times to defend teenagers… by blaming “captains of industry”. No, Mr Allen, your examples fone, fayre, lite, snax, bitz and center are not “words”, still less words that have just been made up by marketing departments. They are spellings. Spellings are different from words. You are not complaining about words, and your comments are not relevant to the question of vocabulary size. You’re complaining about spellings. The words we conventionally spell fair, light, snacks, bits and (BrE) centre have been in English for many centuries. Even the word conventionally written phone is more than a century old, being dated by the OED to 1880 — long before “the mighty supermarkets” existed. As for the word you would like everyone to write as centre, I think you should bear in mind that well over half the native speakers of English in the world spell it as center, a spelling that has been around since the sixteenth century. The sky has not yet fallen in. Nor is anything whatsoever threatened by people sometimes spelling naɪt as nite. (According to the OED, they’ve been doing that too since the 16th century.) Supermarkets indeed have to make a commercial judgment about whether using common-sense spellings of this sort will attract more customers than it will repel. But there is no moral issue involved. And I can’t see how it could affect anyone’s vocabulary size. "The sky has not yet fallen in." I love it. The answer to every such reactionary complaint! Every generation thinks the kids are going to ruin everything. In the old, black & white film "Twelve Angry Men", you hear one man say, "He don't even speak properly," and is corrected by a colleague for using "don't" instead of "doesn't". It was said back then, and it's being said about a different generation now. Why does vocabulary size even matter? All that matters is if we can communicate with one another. We don't have to use pretentious words to do that. In the 1957 film, the defendant is Latino. Not one of the jurors is. All of the jurors are white, and with the exception of Juror No. 11, all are native speakers of American English. Juror No. 10 (played by Ed Begley) says: "Bright? He's a common ignorant slob. He don't even speak good English." Juror No. 11 (played by George Voskovec), is the only immigrant on the jury. He speaks English with a foreign accent, and says, mildly: He "doesn't even speak good English." The interchange, which lasts a few seconds, and which passes without comment by any of the other jurors, is an illustration of the illogic and wrongness of xenophobia and racism; how they can interfere with the careful examination of the facts on their own merits; with so much at stake (the charge of murder is a capital offense), it is literally of vital importance. It's also (as it happens) one of my all time favorite moments in film. Two lines long, and both you and I remember it. I don't think we're alone. There is a generational issue brought up in the character of Juror #3 (Lee J. Cobb), who is estranged from his son. But the way English is spoken doesn't enter into that, unless you count how he describes having to call his father Sir. Of course, our different perspectives on the meaning of this scene just make Reginald Rose's point about perspectives all over again. Of course you're not alone. I always appreciated the unintended second layer of irony, namely that the immigrant is right in correcting the first on the level of what both accept to be proper English, but that descriptively, both are wrong in their premises. The immigrant might speak "proper" English, but the the other two are speaking natural/real &c. English. Also interesting that the language itself has changed even since this film, but in spite of this proof from real life, people will still say about a non-native speaker that his or her English is better than theirs even if it suffers from strong interferences from a foreign mother tongue, as long as the [t]s aren't dropped or tapped and there's always a [d] in and. Prestige of a register and competence in a register are mixed. Glad to see you're all keeping the rant quotient up. So I'll put in my two pennorth on John's original rant. What I have concluded about teenage texting and even post-teenage texting is that it fits into the category of esoteric cant or jargon that Crystal is talking about, with no implications either way for vocabulary, grammaticality, or orthography of any sort – a lot of the conventions do no favours to spelling reform! And often make no sense even in terms of energy conservation: isn't the 8 in Gr8 4 keystrokes, just like –eat? And can you even get gr8 if you're using the predictive text option? I suppose such things do achieve economy of space for the permitted size of the message. But for example "text" itself, as John pointed out somewhere in this blog at some point, loses its t and has a past form texed. Why don't they use tx, txd, txg? Because it's not so techie as the file extension .txt? Looks to me like just a bit more mindless adherence to convention, some of it as John has pointed out actually as venerable in its antecedents as conventional orthography. PS And do you SWALK or nLK? That is the question. @Amy Stoller: Yes, you've recalled very accurately. I'm glad you like the film as well; it's brilliant. What I meant is that, for somebody watching it in 2010, you can see that people were saying the same things back in 1957 that are being said now. People were criticised for their "bad English" by people whose own English was not grammatical, in 1957 as in 2010. There's also a part in the film where one juror says that kids have no respect for their elders anymore. I see the film as proof that human nature doesn't change much over time. @Anonymous: Ah, yes - now I understand what you meant. That may not be what the film was designed to say, but by now it says that, too. Isn't there a quote from antiquity about how the world is going to hell in a handbasket, because kids don't respect their elders? I'm sure I once knew where I could find that, but of course it now escapes me. Probably because, unlike 12 Angry Men, I didn't first encounter it my childhood. @Lipman: I often notice NNS speaking "better" English than NS, but by that I mean that they have a firmer grasp of the grammar and syntax of "standard" English. I have learned to view "non-standard" not as "sub-standard" but simply as a collection of different (and interesting) varieties. But rants about texting, in the teeth of all the genuine evidence, and now this beauty from Martin Allen, are proof that the unthinking worship of "standard" marches on. Well, will you look at that. I got back on topic.